Bach, Johann Sebastian (1685-1750), German organist and composer of the Baroque era, one of the greatest and most productive geniuses in the history of Western music. 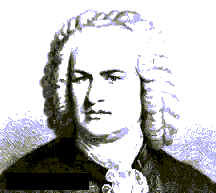 Bach was born on March 21, 1685, in Eisenach, Thuringia, into a family that over seven generations produced at least 53 prominent musicians, from Veit Bach to Wilhelm Friedrich Ernst Bach. Johann Sebastian received his first musical instruction from his father, Johann Ambrosius, a town musician. When his father died, he went to live and study with his elder brother, Johann Christoph, an organist in Ohrdruf. In 1700 Bach began to earn his own living as a chorister at the Church of St Michael in L�neburg. In 1703 he became a violinist in the chamber orchestra of Prince Johann Ernst of Weimar, but later that year he moved to Arnstadt, where he became church organist. In October 1705, Bach secured a one-month leave of absence in order to study with the renowned Danish-born German organist and composer Dietrich Buxtehude, who was then in L�beck and whose organ music greatly influenced Bach's. The visit was so rewarding to Bach that he overstayed his leave by two months. He was criticized by the Church authorities not only for this breach of contract but also for the extravagant flourishes and strange harmonies in his organ accompaniments to congregational singing. He was already too highly respected, however, for either objection to result in his dismissal. In 1707 he married a second cousin, Maria Barbara Bach, and went to M�lhausen as organist in the Church of St Blasius. He went back to Weimar the next year as organist and violinist at the court of Duke Wilhelm Ernst and remained there for the next nine years, becoming director of the court orchestra in 1714. In Weimar he composed about 30 cantatas, including the well-known funeral cantata God's Time Is the Best, and also wrote organ and harpsichord works. He began to travel throughout Germany as an organ virtuoso and as a consultant to organ builders. In 1717 Bach began a 6-year employment as chapelmaster and director of chamber music at the court of Prince Leopold of Anhalt-K?then. During this period he wrote primarily secular music for ensembles and solo instruments. He also prepared music books for his wife and children, with the purpose of teaching them keyboard technique and musicianship. These books include the Well-Tempered Clavier, the Inventions, and the Little Organ Book. Bach's first wife died in 1720, and the next year he married Anna Magdalena Wilcken, a fine singer and daughter of a court musician. She bore him 13 children in addition to the 7 he had had by his first wife, and she helped him in his work by copying the scores of his music for the performers. Bach moved to Leipzig in 1723 and spent the rest of his life there. His position as musical director and choirmaster of St Thomas's church and church school in Leipzig was unsatisfactory in many ways. He squabbled continually with the town council, and neither the council nor the populace appreciated his musical genius. They saw in him little more than a stuffy old man who clung stubbornly to obsolete forms of music. Nonetheless, the 202 cantatas surviving from the 295 that he wrote in Leipzig are still played today, whereas much that was new and in vogue at the time has been forgotten. Most of the cantatas open with a section for chorus and orchestra, continue with alternating recitatives and arias for solo voices and accompaniment, and conclude with a chorale based on a simple Lutheran hymn. The music is at all times closely bound to the text, ennobling the latter immeasurably with its expressiveness and spiritual intensity. Among these works are the Ascension Cantata and the Christmas Oratorio, the latter consisting of six cantatas. The St John Passion and the St Matthew Passion were also written in Leipzig, as was the epic Mass in B Minor. Among the works written for the keyboard during this period are the famous Goldberg Variations; Part II of the Well-Tempered Clavier; and the Art of the Fugue, a magnificent demonstration of his contrapuntal skill in the form of 16 fugues and 4 canons, all on a single theme. Bach's sight began to fail in the last year of his life, and he died on July 28, 1750, after undergoing an unsuccessful eye operation. After Bach's death he was remembered less as a composer than as an organist and harpsichord player. His frequent tours had ensured his reputation as the greatest organist of the time, but his contrapuntal style of writing sounded old-fashioned to his contemporaries, most of whom preferred the new preclassical styles then coming into fashion, which were more homophonic in texture and less contrapuntal than Bach's music. Consequently, for the next 80 years his music was neglected by the public, although a few musicians admired it, among them Wolfgang Amadeus Mozart and Ludwig van Beethoven. A revival of interest in Bach's music occurred in the mid-19th century. The German composer Felix Mendelssohn arranged a performance of the St Matthew Passion in 1829, which did much to awaken popular interest in Bach. The Bach Gesellschaft, formed in 1850, devoted itself assiduously to finding, editing, and publishing Bach's works. Because the Bach revival coincided with the flowering of the Romantic movement in music, performance styles were frequently gross distortions of Bach's intentions. Twentieth-century scholarship, inspired by the early enthusiasm of the French Protestant medical missionary, organist, and musicologist Albert Schweitzer, gradually has unearthed principles of performance that are truer to Bach's era and his music. The significance of Bach's music is due in large part to the scope of his intellect. He is perhaps best known as a supreme master of counterpoint. He was able to understand and use every resource of musical language that was available in the Baroque era. Thus, if he chose, he could combine the rhythmic patterns of French dances, the gracefulness of Italian melody, and the intricacy of German counterpoint all in one composition. At the same time he could write for voice and the various instruments so as to take advantage of the unique properties of construction and tone quality in each. In addition, when a text was associated with the music, Bach could write musical equivalents of verbal ideas, such as an undulating melody to represent the sea, or a canon to describe the Christian following the teaching of Jesus. Bach's ability to assess and exploit the media, styles, and genre of his day enabled him to achieve many remarkable transfers of idiom. For instance, he could take an Italian ensemble composition, such as a violin concerto, and transform it into a convincing work for a single instrument, the harpsichord. By devising intricate melodic lines, he could convey the complex texture of a multivoiced fugue on a single-melody instrument, such as the violin or cello. The conversational rhythms and sparse textures of operatic recitatives can be found in some of his works for solo keyboard. Technical facility alone, of course, was not the source of Bach's greatness. It is the expressiveness of his music, particularly as manifested in the vocal works, that conveys his humanity and that touches listeners everywhere.